An exotic mix of Chinese, Malay, Indian and Western cultures in this deliciously inviting and completely unforgettable island city-state. 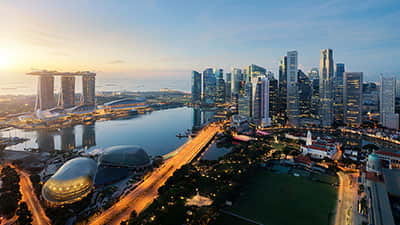 Discover why Singapore has become a well-known luxury travel destination at Marina Bay with it’s one-of-a-kind skyscrapers, iconic hotels, and upscale attractions such as the ArtScience Museum, Marina Bay Sands and Gardens by the Bay. The 101-hectare nature park Gardens by the Bay is an incredible botanical garden and fantasy land of futuristic Supertrees, space-age bio domes, cloud forests and whimsical sculptures. At the ArtScience Museum, check out the iconic lotus flower building that attracts visitors from around the globe for its spectacular architecture, as well as the 20 art galleries and exhibitions inside. For nature lovers, Singapore is a great destination. Get up close with orang-utans at Singapore Zoo, or listen as monkeys chatter in the trees at Bukit Timah Nature Reserve - one of only two cities in the world with a patch of primary rainforest! Wander the streets of Singapore’s historic Chinatown, a mixture of old and new markets filled with yummy aromas and scents. Try stingray and Hainanese chicken in the infamous food markets, observe a ceremony at the Buddha Tooth Relic Temple, and explore the beginnings of Singapore’s early pioneers in the Chinatown Heritage Center.